Dahlonega, Georgia. Photo credit: ugardener. I receive emails regularly from people looking for the local scoop on what trails to ride, where to camp, and what to expect when the sender makes a trip to wherever it is. Right now my region of expertise is North Georgia, since I'm living here at the moment. Great stuff. Appreciate your site! I'm a rider living in *the Northeast*. 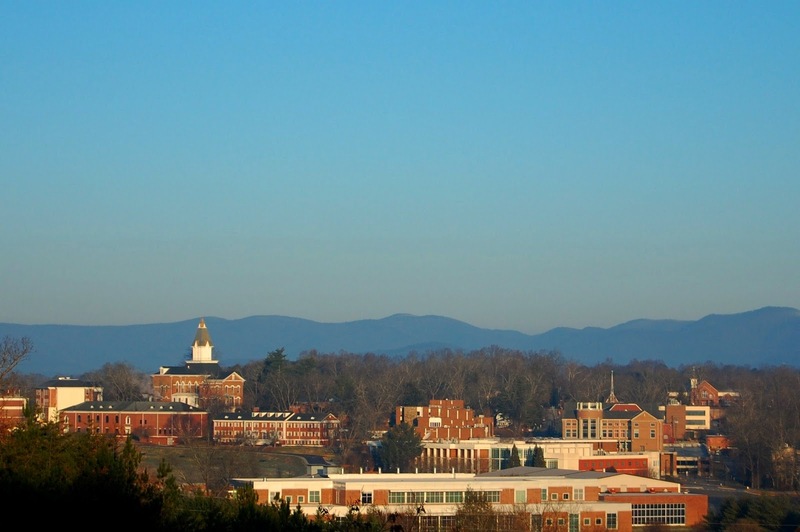 We are currently exploring an opportunity to relocate to the Dahlonega/Gainesville area. We are avid outdoorsy folks. Our hobbies include trail running, mountain biking, hiking, road biking, canoeing, etc. 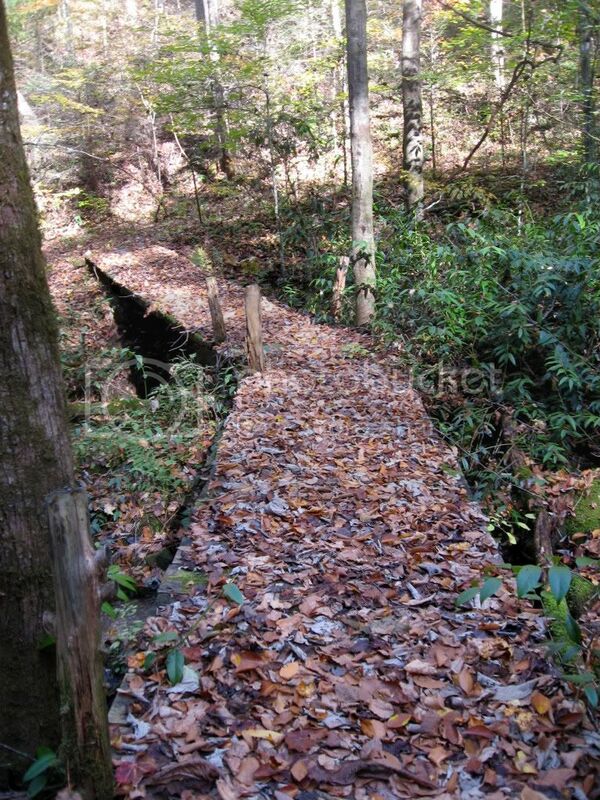 Is there a good amount of mountain biking/trail running terrain around the Dahlonega area? We have been focusing on the professional side of things up until now, the jobs! So we haven't learned too much about the area yet. We really love to ride, hike and run and cannot imagine relocating to a place that does not offer great trails close to home. After finding your site I was hoping to ask you some questions. Can you share any thoughts on the area, the trail networks, the riding season, or anything else you can think of??? Sorry to pester you. Any info you can provide is appreciated. Of course, if this is a bad time, I understand if you cannot reply. Details removed at request of the sender. The various sections in this series will be published over the course of the next 2 weeks. Don't want to miss a single post? "Like" our Facebook Page or subscribe to our feed to get all the updates!. When you bike, there are certain things you need for it. You never know what conditions you will face. With that being said, you want to make sure that you know that you have the gear which you will need in order to make this happen. So, what is some of the essential gear that you will need? We have a few things right here. 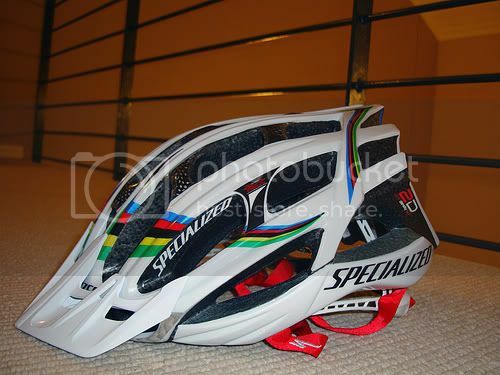 One of the first things that every rider should have is a mountain bike helmet. In order for it to do what it's supposed to do for you, you have to make sure that it fits properly. This is essential and therefore, you need to try it on. One size doesn't fit all, just remember that. Another thing that you might need is a pair of sunglasses. The sun can get pretty bright and this can cause you to crash if you aren't careful. You don't want this. Therefore, make sure that you are able to see. This can help greatly. They do make mountain biking glasses which don't slip and fit just right. You also want to stay warm when you go mountain biking. That is why a jacket might be needed. The same goes with the right pants and the right shirts. They have this as well on some sites which sell all the essential gear which you might need. For guys, the shorts are great as they don't bunch up and you don't sweat so bad. If you are going to wear pants that go down to your ankles, then it's best if you wear pants that aren't too wide, which is essential as it limits how much danger you are in. There are many who wear baggy pants when they go about biking and then their pants get caught in the chains or on the pedals. This can make a person go about and fall. So, save yourself from a wipe out. When you have these things, you are then ready to bike. Biking is very good for you, but if you are going to be serious about it, then you might like to think about getting this essential gear for all your biking needs. It can help you greatly and protect you for the biking that you will be doing. There are many places that you can go in order to buy these things. When you get them, you will find that you will have an easier time riding. Thank you Corey for keeping the beginners in mind and helping them along! back trails or riding through the city. Check out his site to help you research mountain bikes. I am so thankful for my beautiful wife of almost one year, a God who loves me and has a plan for my life, tons of great food to eat today, and of course, sweet singletrack to ride! 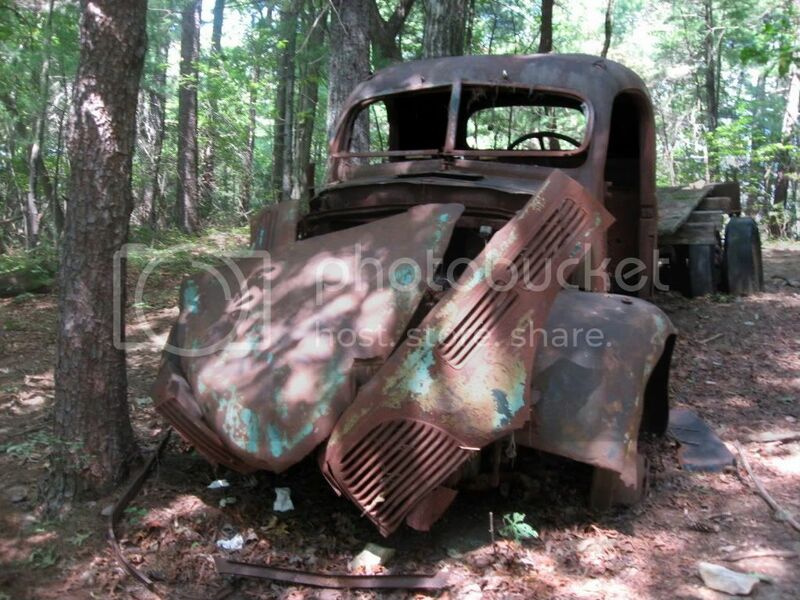 Flint Ridge, North Carolina from Greg Heil on Vimeo. This video was taken at Flint Ridge in North Carolina. Oh and yeah, I know the music doesn't quite fit the riding, haha! But it's still good! If you're looking for more videos to satisfy your mountain bike media craving, check out this post from last week featuring 3 of Marty Tank's videos. To be completely honest, he does a way better job of shooting and editing video than I do! I just had a guest blog post go live on Singletracks.com entitled "Mountain Biking Through History." 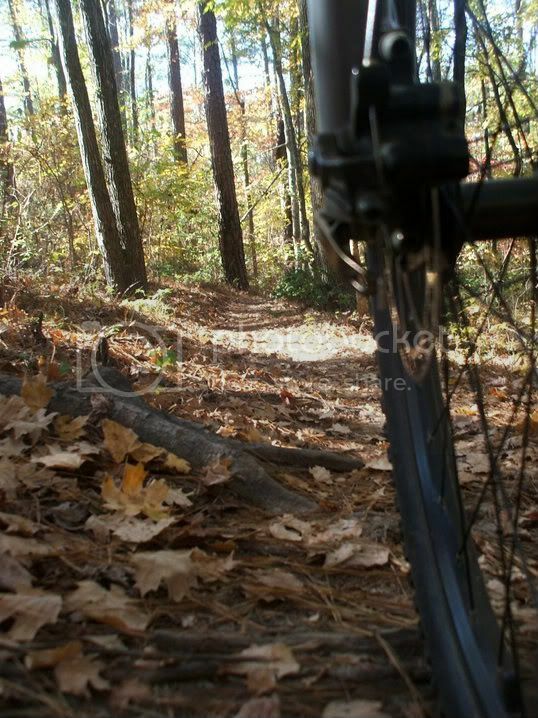 Sometimes a mountain bike ride is more than simply pedaling through the woods. Sometimes it's a journey through history! "You've Got to FIGHT--for Your RIGHT--to PAR-TAY!" In the words of the Beastie Boys, "You've got to FIGHT--for your RIGHT--to PAR-TAY!" As mountain bikers, we all know that great singletrack is the most important part of our lifelong par-tay! Blackburn Park just outside of Dahlonega, Georgia may be resurrected from its current abandoned state and transformed into a new public county park. I personally haven't heard any more information on the status of this proposal, but the survey, located here, that is being used to gauge public approval for the project and the proposed mountain bike trails is only open through the 27th of November. If you have not yet taken this survey and voiced your desire for some new mountain bike trails, please do so now! When I first posted about the mountain bikes-in-wilderness proposition, we were losing by 49 votes. As of 8:52 AM on November 21 when this post was written, we are currently winning by 198 votes! The total number of votes against the proposal are 298, the total number of votes for are 496. The fact that such a remarkable swing of 250 votes took place in the course of about a week was pretty sweet, but I'm still amazed that there are only 496 votes on the mountain biking side of the issue. How many hundreds of thousands of mountain bikers are there in the nation? This vote could easily be swept away by a flood of pro-mountain bike votes if people would just be involved in the mountain bike scene. Maybe that should be the new mission of Greg Rides Trails: help get people involved in the mountain bike scene and get them to actively advocate for their right to mountain bike. Of course, I'm not falsely accusing you of not getting involved, because I know that all of the readers of GRT are fighters! 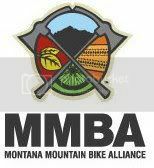 The Montana Mountain Bike Alliance is the advocacy group that had been working tirelessly in an attempt to keep the Bozeman area from losing hundreds of miles of trails simply because the area had been proposed as a new Wilderness. Their initial efforts weren't enough, but they are working to reverse this horrible legislation. Learn about their organization, get involved, and join their Facebook Page here. Wilderness B = Wilderness with Bikes. Wilderness B - a movement to create awareness among elected officials of the need to update public land protection's acknowledged historical gold standard by creating a sister designation that provides ALL of Wilderness's protections, yet allows bicycles. Why? Because mountain bikers are staunch preservationists and to date the Wilderness lobby has self-servingly lobbied against the inclusion of bicycles despite the fact that science and US Forest Service studies have repeatedly debunked their claim that bikes have more impact then hikers. The truth? Bikes have LESS impact. Our protected public lands are at risk. From development, be it mining, timber or other commercial interests. The Wilderness movement asks us to support their efforts to protect more land, and in doing so forever restrict our own access. It's time for the ranks of backcountry stewards to recognize the incredible body of work the mountain bike community has compiled over the past three decades. A collective voice in the service of public lands protection is exponentially more powerful than the fragmented and contentious dialogue characteristic of old guard Wilderness advocates portrayal of the mountain bike community. Please join this page. Please ask your fellow mountain bikers to do the same. The power of numbers can and will give our elected officials pause to fully consider the issue rather than continuing to take their land preservation cues from an entrenched and well-funded hiking lobby. Yeah, that's so well said! Join the Wilderness B Facebook Page now! Last but not least, please be sure to join PeopleForBikes.org. People For Bikes is an interesting advocacy organization that is gathering cyclists from all disciplines together to advocate for bicycling rights and privileges. We have just recently reached the milestone of 150,000 signatures on the online pledge, and we're aiming for many, many more! Millions of people in the United States ride bicycles, and it's my hope that we see every one of them sign this pledge! It's free, it's easy, and by becoming a part of this organization you can help influence policy makers in D.C. Your Turn: If I haven't already given you enough homework in the above post, please feel free to share your thoughts on bicycle advocacy in the comments section below. 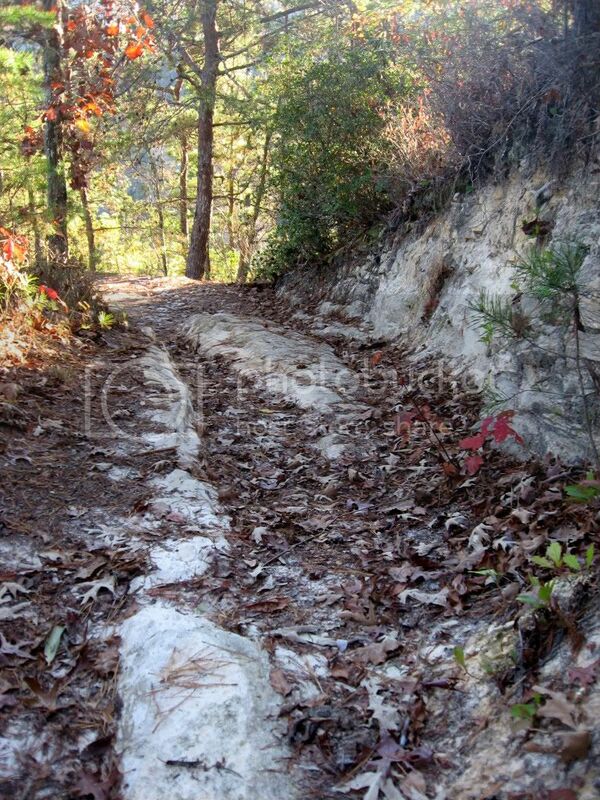 Long slab of rock in the trail. Flint Ridge probably has the best switchbacked climb that I have ridden this side of the Rocky Mountains! 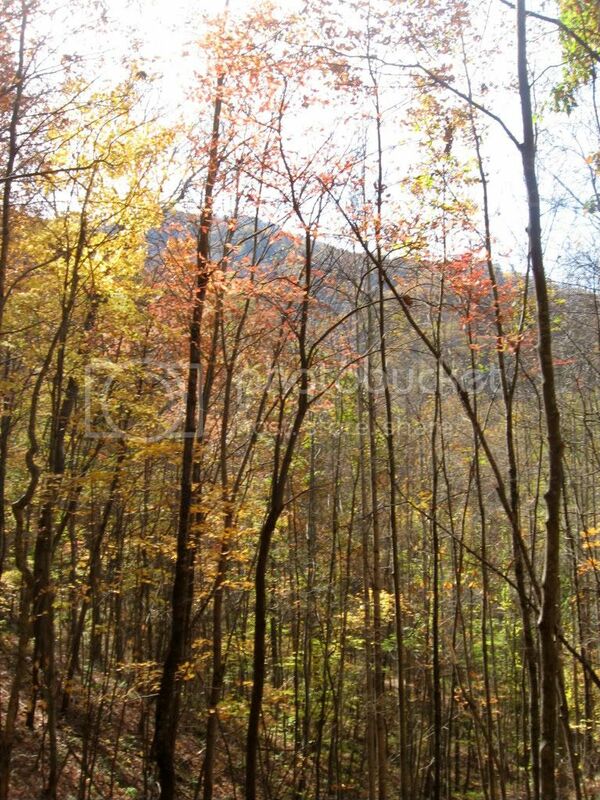 The initial section of singletrack is benched into the incredibly steep side of Nantahala Gorge. I have no idea how much work it took to build this trail and these turns, but the quality construction has paid off in a challenging-yet-rideable climb: a tough balance to achieve. As I ascended this trail, I was breathing pretty hard due to the steep ascent right off the bat without any sort of warm up, and the relatively high cadence that I was pushing in my granny gear. Using a 36 tooth big cog in the rear, I felt like I could climb these switchbacks with reasonable ease, thus the relatively high cadence. It was still a serious workout and a challenge, but with the right gearing this trail is completely climbable! The singletrack trails here at the Nantahala Outdoor Center were definitely purpose-built for mountain biking. One of many beautiful switchbacks. After the initial set of switchbacks, the trail becomes much more rolling and the climbs become more moderate. 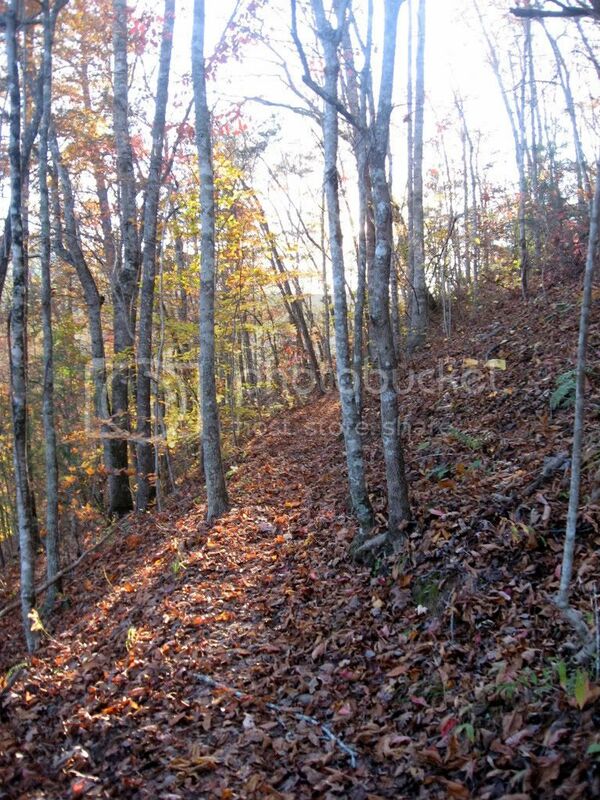 The singletrack winds along the ridge high above the Nantahala river. 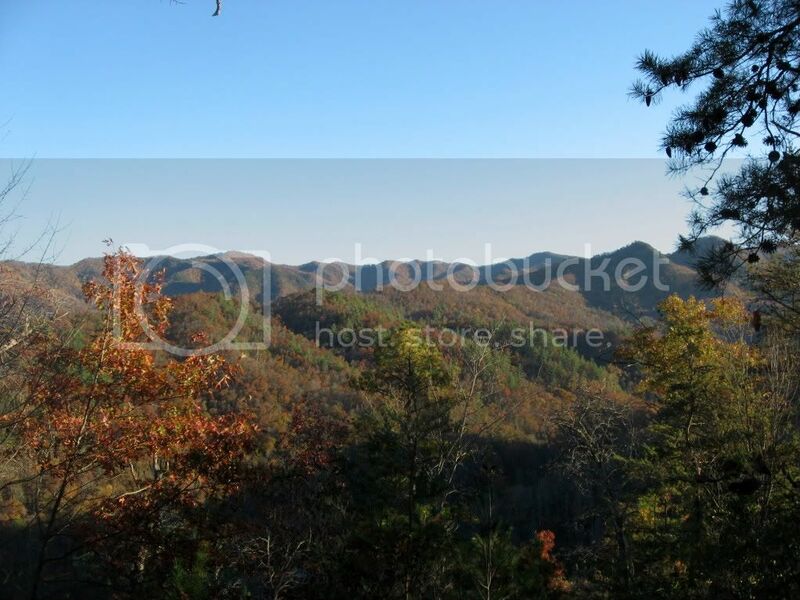 There are several amazing views from the trail, so be sure to bring your camera! As far as the actual trail construction, it appears to have been mostly machine built, with the bench-cutting usually about 4 feet wide. In spots the bench narrows to 2 feet and in others it widens to 5 or more. Despite the width of the bench, there is always a prominently defined trail of about 18-24 inches in width running down it, offering a true singlsetrack experience. 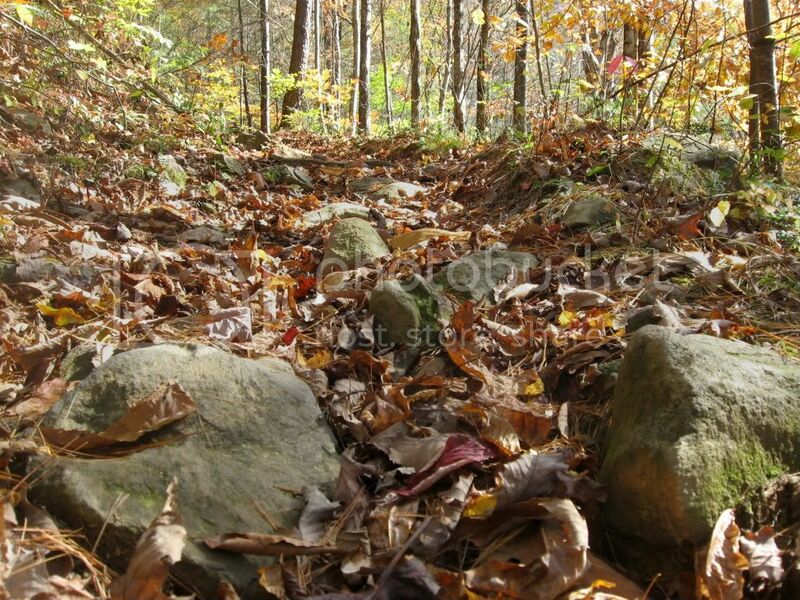 Flint Ridge is a classic example of machine-built trail done right! 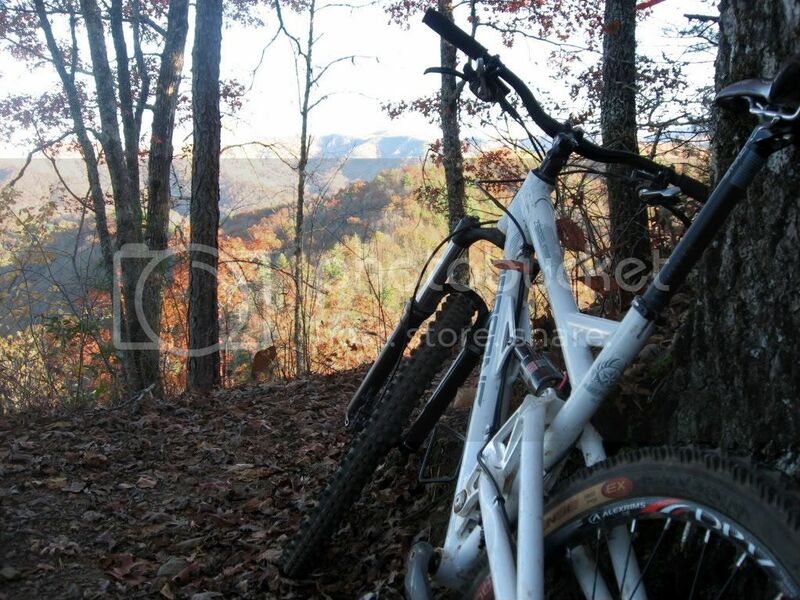 View of Nantahala National Forest from the mountain bike trail. Of course, at the moment this is all hear-say, but if this all came to pass: wow! 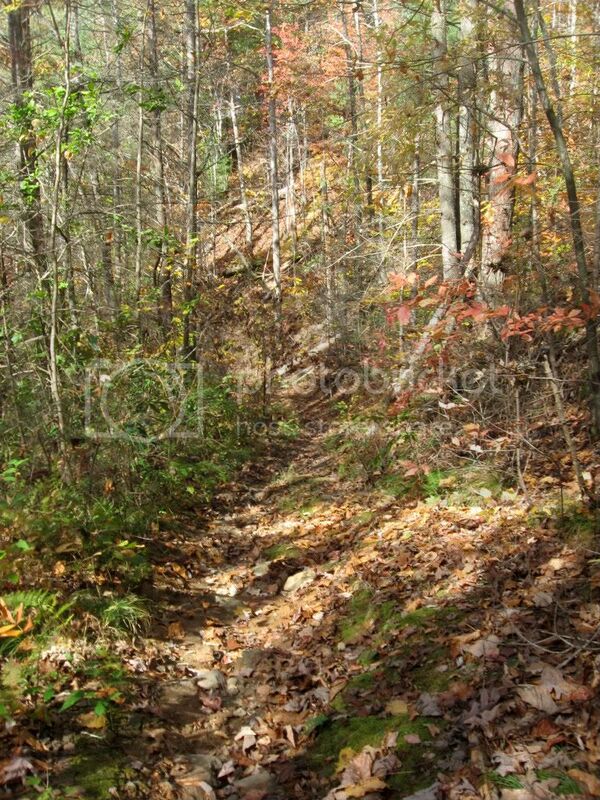 As I told the guy I met, this would be a great location for such a trail system. Sure, Tsali is located to the north about 10 miles or so, but there is nothing significant to the south until you reach Blue Ridge in Georgia. (I have heard some rumors about trails at Hanging Dog in Murphy, but word on the street is they aren't very impressive. I hope to check them out in the near future and give you all the truth about what's there.) If the guys at Flint Ridge and NOC could build a system that harbored some serious technical riding, I think this place could be a great hit! 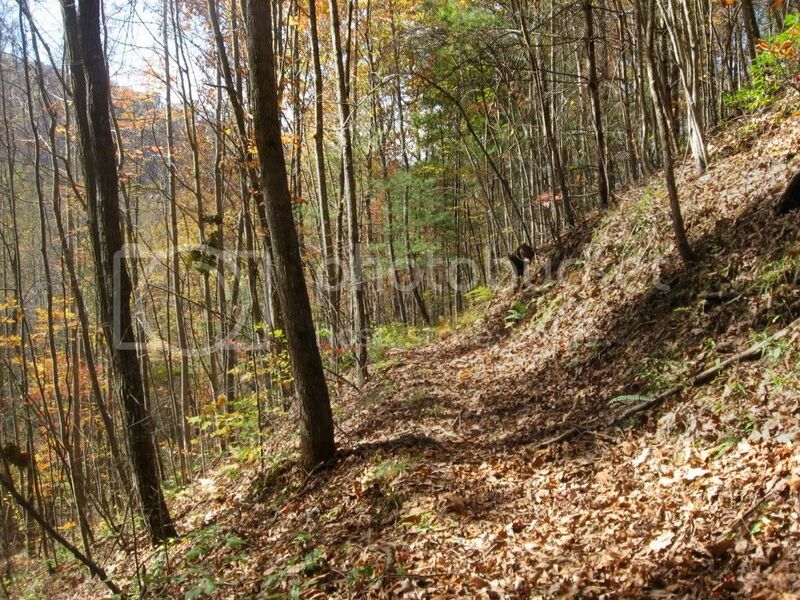 Bottom Line: While Flint Ridge already has some decent trails harboring amazing switchbacks that are worth a look, this is the trail system to keep your eyes on over the next 5 years! When traveling on US 19/74, hang a left over the bridge into the Nantahala Outdoor Center. After you cross the railroad tracks, tack a left up the steep, paved hill. There'll be a big sign at the base of the hill and it will have an indicator for the mountain bike trails with an arrow. Park in the "base camp" parking lot and continue riding on your mountain bike up the road. Once you are continuing up the paved hill on your mountain bike, follow the signs for the Flint Ridge trail. Go up past what looks like an old pump house to access the trail and begin the switchbacked climb mentioned above. After this, navigating on the trail system is pretty hairy at the time of this review. The new gravel road that seems to go straight through what used to be the mountain bike trail network has messed up the navigation. Some signs are missing, or incorrectly placed. However, if at any point you reach the gravel road and follow it downhill, it will drop you out right at the beginning of the trail, so getting seriously lost isn't really an issue! As far as I'm aware, there are no current navigational resources for this trail. Also, if you're digging this trail review, be sure to "like" the Greg Rides Trails Facebook page and stay in the know! been sitting in a box for 6 months. But don't worry.... they're clean! Hopefully you find the content here on Greg Rides Trails exceedingly useful and would be more than happy to share it with a friend... especially if there's the possibility of getting some free shwag in return! There has been an ongoing t-shirt giveaway here on Greg Rides Trails, and all you have to do to qualify for the drawing is to share a link to one of these many blog posts, and then post proof to show that you done it! More details on the contest are available here. Congratulations on winning some free schwag guys, and thanks for being active members of the Greg Rides Trails community! Note: These winners were selected on Friday, and their shirts should already be out in the mail. The next drawing will be this Friday or Saturday, so share some links! From FATS. Photo Credit: Brian W.
Also, a big thank you goes out to Brian W. for shooting some photos of the FATS Trail System near Augusta, South Carolina and allowing them to be used in the post here on Greg Rides Trails. I published that review way back in Greg Rides Trails' first month of life, but I hadn't taken my camera with me when I rode those trails. Since its original publication, the FATS review has been one of the top 3 viewed trail reviews here on the blog, and it has been devoid of pretty pictures all this time. Thanks to Brian, the FATS page is now up to the quality level that I've come to demand from all the reviews here on GRT! Ok, I lied: One more big "thank you!" 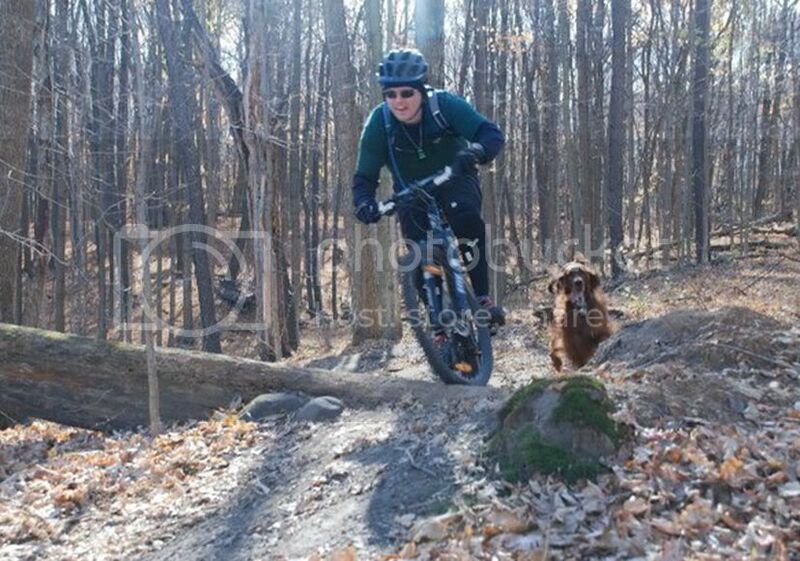 A big thanks goes out to Scott Melzer for his incredibly useful, detailed guide to mountain biking with canines that just went live on the blog yesterday. 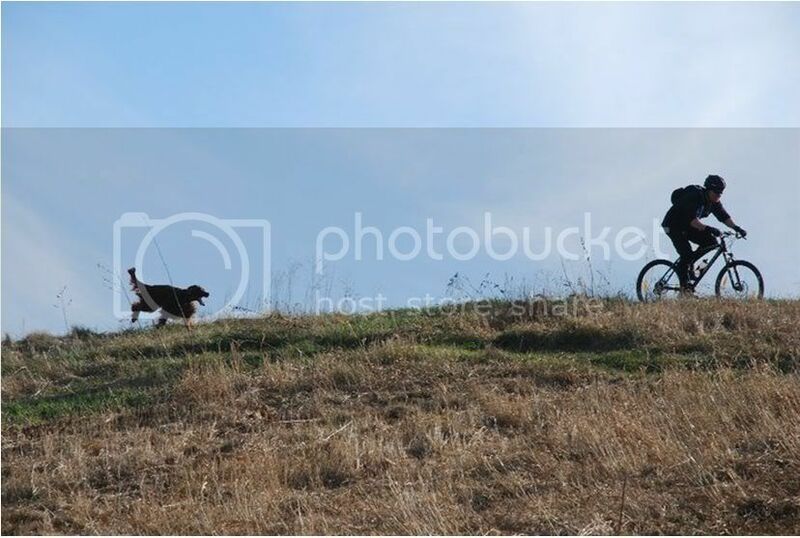 If you missed it, click over and get the scoop on what it takes to get out on the singletrack with your dog! The following is a guest post by Scott Melzer. The world of mountain biking has many aspects. The world of riding with your dog can be one of them if you prepare ahead of time. Riding with your four footed friend can be a great combination not unlike peanut butter and jelly. Sadly it can also turn out like oil and water. I will attempt to offer tips and guidelines to help you in your mountain biking endeavors. Keep in mind I am no expert in dog training nor do I try to pretend to be. I can cover the basics. I also know that it is a learning process with no diplomas, because the learning never stops. There are many reasons why riding with your dog can be something to look forward to. Looking over your shoulder as you fly along the trail and seeing the dog’s face of blissful joy is where it all starts. A well-trained and behaved trail dog makes a great riding buddy. The relationship between pet and master can be improved upon when the dog has a sense of accomplishment and has pleased its master. Getting home after a good ride and seeing your pooch as spent as yourself is like killing two birds with one stone. First thing to consider is the dog you will be riding with. Not all dogs make great trail dogs. Three things to look at are breed, age and fitness of the dog. Breed will be a big factor. I would suggest that the sporting group offer the most likely success on the trail than the other groups of breeds. Too small of a breed will not be able to keep up due to a short stride and might be more prone to injury. Too big of a breed will have trouble keeping up on longer rides as well as having injury due to size and weight. Stay away from aggressive type breed such as guard dogs. The last thing you or others will want is a dog hurting itself or others on the trails. Chances are if your dog is aggressive when walking or at home, it’s best to leave the dog home. A dog ranging from 40lbs to 70lbs with a long stride and short coat fits the sport best. Mongols can be a wildcard. Knowing your dog is something I cannot stress enough. When looking at your dog know its pros and cons before hitting the trails and prepare for problems that will arise. Age for prime performance would be two to seven years. Under a year do not push the pup on the trail with the bike just yet. Rather focus on training and command words. A large open yet safe area is ideal for your pup to learn the ropes. Dog parks can fit the bill, but can also divert attention away from training with other dogs running around. Also pups are still growing and trail terrain can put stress on shoulder and hip joints, particularly on down hills. So slow down a little on descents even with older dogs. Most dogs after the age of seven start to lose a step and are on their way to retirement from the biking lifestyle. Fitness of the trail dog must be kept in mind before that long ride. Start with a trail that is a less than three miles in order to build the dog's endurance to peak level. Also having a trail that is a short loop is ideal simply for the fact if something like a injury or fatigue set in you're not too far from the car and the ride home. Training and tools are the bread and butter of a successful ride. I have found that hunting bird dog books have a lot to offer as far as working command words. I have found that such books also offer wordless commands like being able to point in the direction with your hand where you want the dog to go. The dog must learn to respect the front wheel of the bike. Ride slow and nudge him or her with the front tire and use command words such as “Move it” or “Outta the way”. Most dogs will learn this lesson fast. Using short phrases for commands works best for the dog. Obedience classes would not be a bad idea, just to get things steered in the right direction. The most useful tool I have found and would not hit the trail without is the whistle. Just a plain whistle like a ref. would use will work. I prefer the plastic variation since it will not get cold when the winter winds start to blow. I wear the whistle around my neck on a chain so that it’s easily within hands reach at all times. I mostly use the sound of the whistle to reel the dog back to a heel position if he gets too far out or takes a wrong turn. It beats having to yell at the top of your lungs, which tends to be counter productive when training a dog. This should be taught to the dog as early as possible. I found that sitting a puppy down and commanding him to “stay” then walking away a good distance while the pup remains in a set spot then using two short loud burst of the whistle to bring him to you works great out in the field or trails. This way the dog will be able to hear you from a great distance and make it back to you. A small bell for the dogs collar is a useful tool also, since it will help you and others keep track of the dog position on the trail without having to have him in your eyesight. This works well since the preferred place for the dog is behind your bike. I have found that my dog likes to lead at the start of the ride. As the miles add up he is smart enough to stick near me and pace himself. A water bottle is a must since hydration is a critical for the dog. Teach them at a young age to drink from the bottle or camelback. Also try to ration the water in small amounts so the dog does not get too full when running. Give the dog a drink or two as often as every fifteen minutes . This also goes for feeding time. Do not feed the dog an hour before or after a ride. It can cause "bloat," which is the result of the combination food and exercise. This can lead to the dog’s stomach flipping and twisting. Bloat can be fatal and some dogs can be more prone to it more than others: mostly breeds that have a deep chest, which puts their tummies in a more problem like position. Poor hydration and heat can be bad news for your dog. I have an Irish Setter and he has a thick, full coat that does not work well in warm weather, so I do not take him out in 60 plus weather. Even in temperature in the 50’s I keep an eye on him. I have learned to watch his tail like a fuel gauge. When the tail points skyward he is on a full tank so to speak. When the tail is dragging towards the ground he is running on empty. Do not make a dog run if he is lying down. Most likely you are done for the day and will be walking the rest of the way back. Dog boots can be a useful tool. I have found them to be pricey and they wear out very fast. They also tend to heat the dog up more since dogs cool off though their feet, so keep that in mind on warmer days. Yet dog boots can be useful for any trail dog that will be running though rock gardens and other tough terrain. In some cases dogs may have tender feet from not being outdoors enough. I would suggest that you try to keep your dog on smoother trails if possible. I also have had the problem of these boots popping off during riding sessions. The last thing you want is to back track though the trails looking for lost booties, so I have used sporting tape to keep them on the dog’s paws, much like a football player tapes up his cleats or a boxer tapes up his gloves. Most of these boots use Velcro straps that rip open on long rides. A light tape job that is not too tight will make sure the Velcro straps stay in place and stay on the paws. Just make sure the tape job does not hinder the movement of the leg of the dog by flexing the leg gently back and forth. Preventive maintenance is also a must before you take to the trails. Make sure you look into flea/tick/heartworm medication by asking you veterinarian about options for each product available. A good tick shampoo after rides never hurts either. In hunting season it’s not a bad idea to equip your dog in a blaze orange vest just to play it safe. The most important tool your dog has is you. Make sure you are in control of your dog at all times, especially near roads and any traffic situation. Carry a leash at all times in order to keep the dog in control when problems arise. It is better to ride alone with your dog rather than with groups of riders. If you do end up with a group share your commands with them and try to keep to the back of the pack so the dog does not get in the other riders' ways. Also it is best to ride at non-peak hours of the trail. Early morning works best followed by late afternoon/early evening. Taking to the trails at these times will benefit you and your dog by keeping you away from other bikers and taking advantage of the cooler parts of the day. Dogs can make great riding partners. Like the old quotes says, “The more people I meet the more I like my dog” and "Every dog must have his day”. Riding with man’s best friend can make your day. 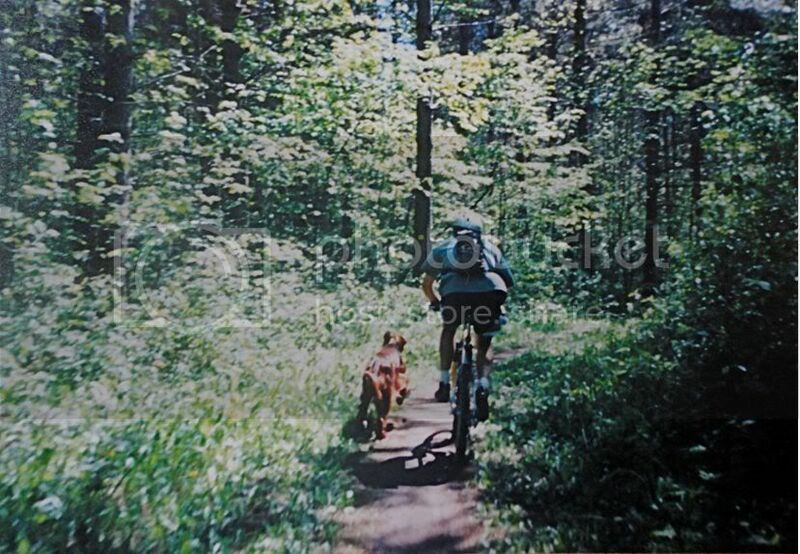 Scott Melzer is an avid mountain biker living in Wisconsin who has spent many years riding his mountain bike while being chased by one of his furry friends. If you want to read more by Scott, be sure to check out his review of the Copper Harbor Trail System in the U.P. of Michigan. Vote NOW for Mountain Biking Trail Access Across the Nation! Apparently, there is a federal government website dedicated to understanding how the public wants to use public lands. A proposition has been posted on that site to protect the status of current mountain bike trails, and to allow mountain bikes access to additional trails in suitable wilderness areas. The time to vote is coming to a close, but only 229 people have voted for it (pro-mountain biking) and 278 people have voted against it (anti-mountain biking). That means we are losing. Update 8:52 11/12/10: I wrote this earlier in the day and posted it to several big forums (MTBR, Singletracks, Sorba) so it'd get some real publicity. Now we're up 337 to 278. Go mountain bikers! Update 7:49 am 11/13/10: Currently 359 to 278: We're up by 81! Update 7:50 am 11/15/2010 We are currently up by 156! Awesomeness! This is the first I've heard of it, and maybe it's the first time you've heard of it too. What we all need to do is GET ON THERE AND VOTE! There are hundreds of thousands of mountain bikers in this nation, and millions of cyclists, why have only 229 people said their piece? We need to publicize this as much as we can so that our collective voice can be heard! We could easily dominate this vote if people would just stand up and be counted... so get on there and vote for more trails! Signing up literally takes 30 seconds, you can register and vote in next to no time. Click here and vote for mountain biking now! I agree with the proposition above on all accounts. Mountain biking hadn't even been conceived of when the original Wilderness designation was created, and was still in it's infancy in '84. The point that any trails which currently support equestrian traffic can definitely support mountain biking is especially true. Horses are much more detrimental to the trail than mountain bikes: I've seen the proof on my local trail system with my own eyes when comparing trails open to everyone and those only open to mountain bikes and hikers. Finally, I exceedingly agree with the statement above about segregation. Segregated trails just make us all separate and unequal, and people that promote that agenda are bigots. Strong language, but oh-so-true, especially when the exceedingly small environmental impact of mountain bikes is considered! I say protect our current singletrack, and continue to open more to mountain bikes! Click here to read the follow up to this post on mountain bike advocacy. Lower Lewellyn Cove Trail, Fontana. The trails at Fontana are commonly referred to as "little Pisgah," and for good reason: they are rocky, they are steep, and they are a ton of fun! The individual trails that comprise this system can vary widely in their width, steepness, and technical difficulty. While many of the trails are nice, narrow singletrack, some are much more doubletrack-esque. One of these wider trails actually used to be a narrow gauge railroad winding through the North Carolina mountains: awesome! This loop begins right at the eastern entrance to Fontana Village. The climb up the doubletracky Upper Lewellyn trail is pretty moderate and non-technical. Once you turn off onto Lower Lewellyn though, get ready for a steep onslaught of rocky goodness! The initial drop into Lower Lewellyn has got to be one of the best rock gardens that I have ridden in a long time! Keep your eyes up and looking down the trail though, because there are several sharp switchbacks that seem to come out of nowhere. Attention is crucial on these turns, because they are pretty exposed. As Lewellyn continues, it drops down into a gorgeous section of deep forest and crosses a bridge over a beautiful rocky stream. 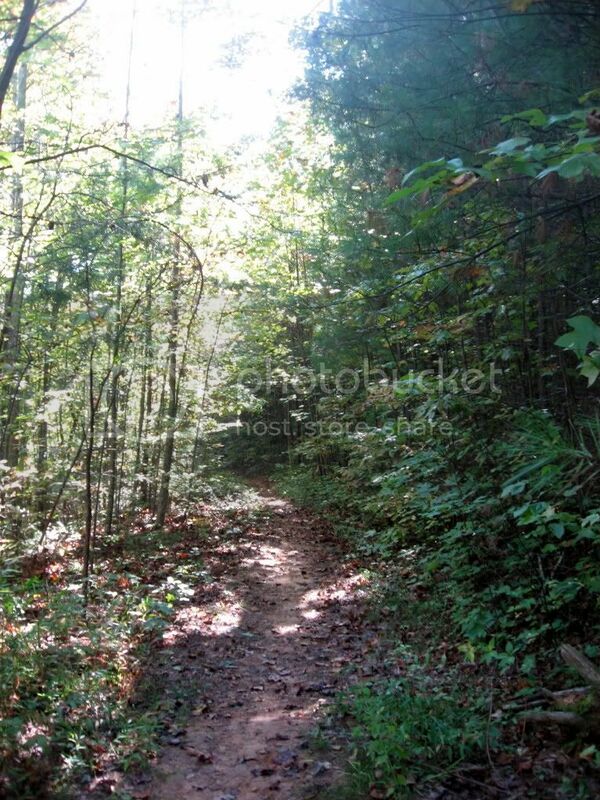 Enjoy the serenity of the forest, as the trail will soon demand your full attention! The singletrack then turns toward the highway and starts to climb... and climb and climb and climb! The climbing isn't actually the most notable feature of this section of the trail--it's really the exposure! So few trails in the Southeast actually contain any serious exposure, and this section of Lower Lewellyn is an absolute breath of fresh air in that respect. There's nothing like riding along a trail that's 18-24 inches wide with a drop of 20+ feet on one side. Not only would a serious fall await you if your concentration erred just a fraction, but you would definitely end up on the highway with the potential to become serious roadkill in a hurry! This trail undoubtedly fits the description of "airy": and I love it! 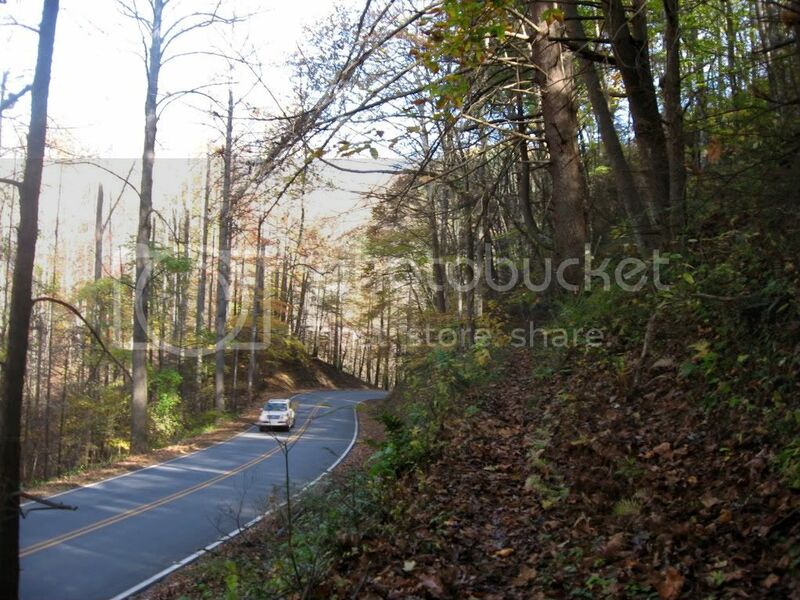 Located up off of the gravel road dubbed "Fontana Village Road," the Gold Branch trail is nice and narrow, with some steep climbs that will undoubtedly force you to granny-gear it. 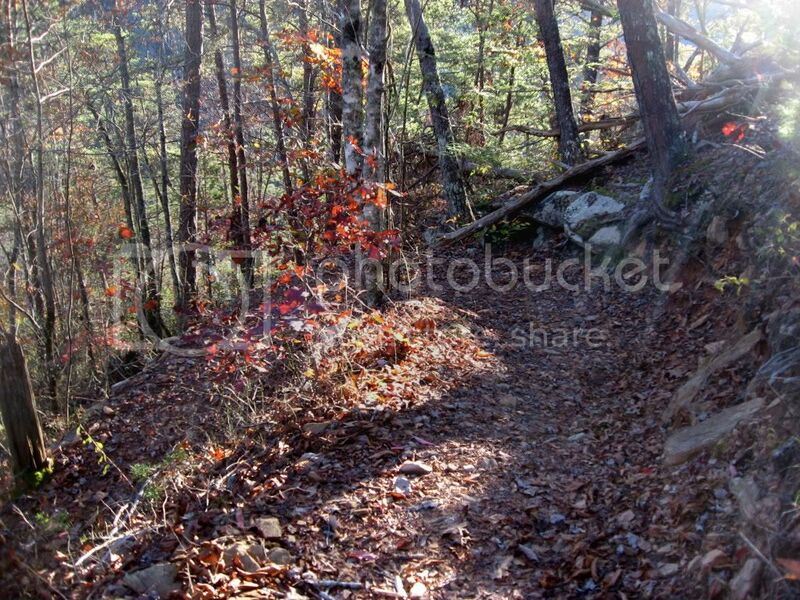 This trail is surprisingly devoid of many roots or rocks, but it does contain a large number of steep, tight switchbacks. Despite the steep grade, these switchbacks were all very rideable, and I was absolutely soaking up these sharp turns! There's an art to building a fun, classic switchback, and the builders of Gold Branch nailed it! The only other place that I've ridden in the Southeast that has such a challenging but rewarding set of switchbacks is Flint Ridge at the Nantahala Outdoor Center. 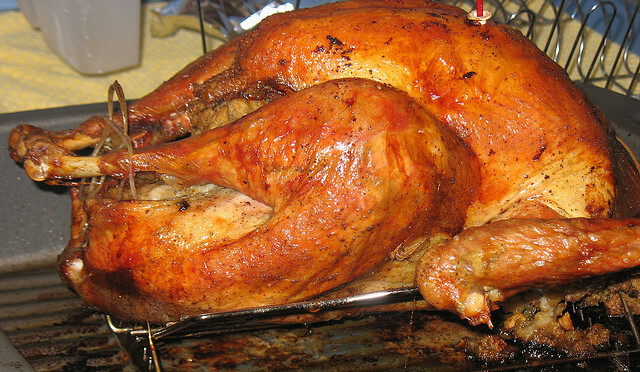 Turkey Shoot is a classic descent, and is utilized as the downhill course whenever a race is held here at Fontana (usually about twice a year). That said, owning a burly DH sled isn't a prerequisite for riding this trail; it is totally rideable at high speed on a 4-5" travel full-suspension bike, or slower speed on a hardtail. The trail drops steep and fast down the side of the mountain, losing elevation at a crazy rate! Lips just begging to be launched off of crop up on the top of most every rise, providing ample opportunities for the adrenaline addict to catch some serious air! Be sure that you can handle the landing though, because the roots and rocks are plentiful... and deliciously entertaining! The tread does consist of fairly wide singletrack that allows you a little room to maneuver and select an appropriate line, which is pretty standard on a downhill course. If I had plenty of time to spend at Fontana and ride, I could easily see myself running lap after lap on Turkey Shoot: this is one trail that you do not want to miss! Bottom Line: Fontana is one rough-and-tumble trail system, and definitely isn't for the faint of heart or legs! But if you are up for the challenge, the rocky climbs and descents of Fontana can be incredibly rewarding! Bridge on Lower Lewellyn Cove. Since Fontana Village is a resort, naturally the nearby lodging options are plentiful. Fontana offers a little bit of everything, including: hotel-type rooms, private suites, cabins, and campsites. Not only does Fontana provide great mountain biking and lodging, but there are opportunities to hike, swim, play mini golf, disc golf, enjoy fine dining right at Fontana, and take in the local sites. Visit their website for more information. Timm Muth has written the guidebook for the Fontana Village Trail System. It includes several different combinations of trails that are each an awesome, unique ride. It includes very accurate maps of the system, and detailed descriptions of every section of trail. Since this place can really be a maze, I highly suggest that you buy this book. I actually had the opportunity to meet up with Timm and be shown around these trails in person. Timm is a skilled mountain biker and an all around nice guy, and it was really a pleasure to ride with him. I really enjoyed getting to hear some of the history behind the riding in this area, in addition to getting the inside scoop on mountain biking all across the state! Thank you Timm for the great time! Of course, you don't need to meet up with the author of a guidebook in order to navigate these trails.... just buy the book. I used it to navigate through a figure 8 loop comprised of 4 different trails the day before Timm and I met up, and I've just got to say it again: this book is a must-buy if you don't want to worry about getting lost! While traveling west on US Hwy. 74, take a left onto Hwy. 28 towards Almond. Follow Hwy. 28 for about 22.5 miles, and then take a left into Fontana Village Resort. Map to Fontana Village from the East. When heading northeast on US Hwy. 129/74, take a left off of 74 and continue to follow 129 for 11.5 miles. Take a right at NC 143 and follow that for 8.8 miles. 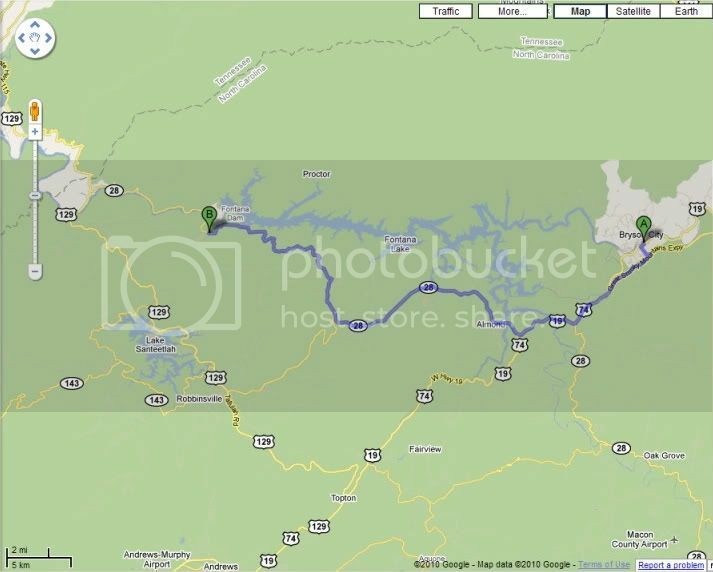 Take a left at NC 28 and follow that for about 11 miles, and then take a left into Fontana Village Resort. Map to Fontana Village Resort from the South. Park near the entrance. Lewellyn Cove starts right next to the entrance, and the rest of the trails can be accessed just a little further in and up in the trees. It keeps you from getting burnt out by doing just one sport. The right sport can help work different muscle groups in your body to make you a well-rounded athlete. Or a different sport can work the same muscle groups used frequently while on the mountain bike and help to keep them in top shape. As I wrote just a few days ago, rock climbing is an excellent way to take a mental break from mountain biking and avoid burnout. Today, we'll also see that rock climbing is an excellent way to become a balanced athlete as well. Let's be honest: mountain biking is anything but a whole-body workout. There are several muscle groups that get seriously underplayed during long cross-country rides. They include: forearms, mid-upper back, upper body in general, core, hamstrings, and calves. To really be a well-rounded athlete that can perform well in a variety of situations not on the back of a bike, as well as in adverse conditions found in mountain biking such as long, steep hike-a-bikes in horrible mud in La Ruta de los Conquistadores, you've got to participate in sports other than just mountain biking. Rock climbing, for instance, is an incredible full-body workout. Many of the muscle groups that remain largely overlooked by mountain biking are heavily utilized when ascending a rock face. 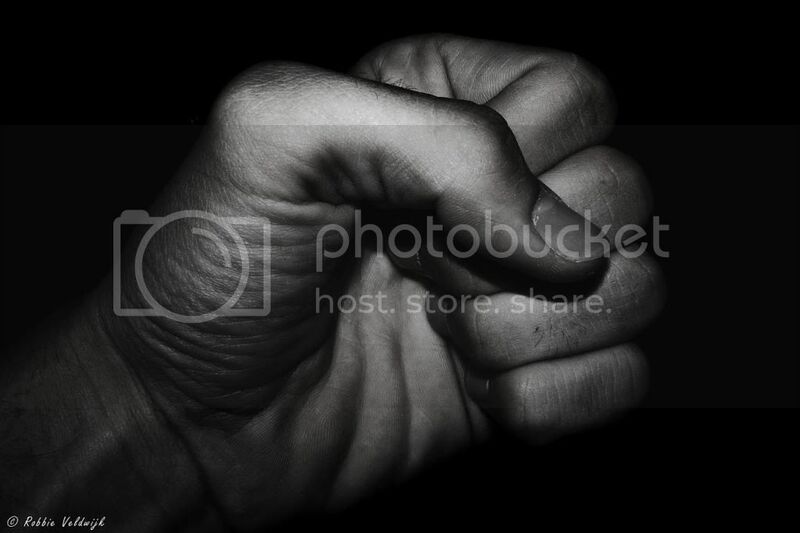 Most notably, your forearms will get seriously worked over, especially on overhanging rock. Your back and shoulders will really feel worked, and your calves can get a pretty decent burn as well. The quad muscles are, or at least should be, utilized significantly during rock climbing, but as a mountain biker you'll probably never reach the sort of pain threshold that you would on a bike. During my first couple of serious days of downhill mountain biking, I noticed that my forearms and calves were taking a royal beating, but that my quads felt like they could keep it up for days. 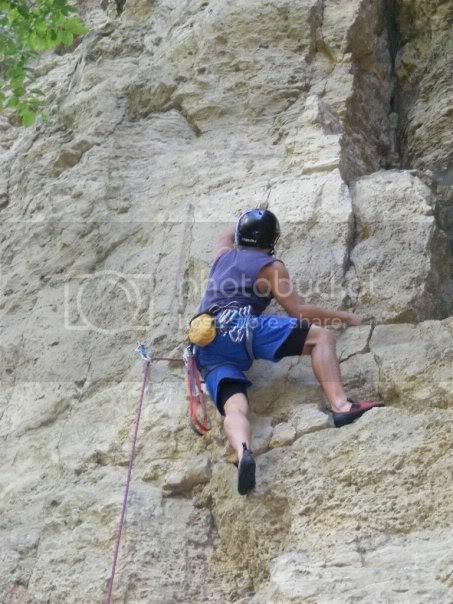 As I mentioned above, forearms and calves are two of the muscle groups that get a decent work out from rock climbing. It's logical to conclude that downhill mountain biking and rock climbing are complementary sports. If you own a downhill rig but don't get access to a lift very often, rock climbing would be a great way to keep those muscle groups in shape for when you do get a chance to get away to the resort and ride some lifts. The appeals of rock climbing to the avid mountain biker are myriad. Not only is it a great mental break from pushing the cranks, but it works muscles that aren't used much on a cross country bike but are used a lot on a downhill bike. 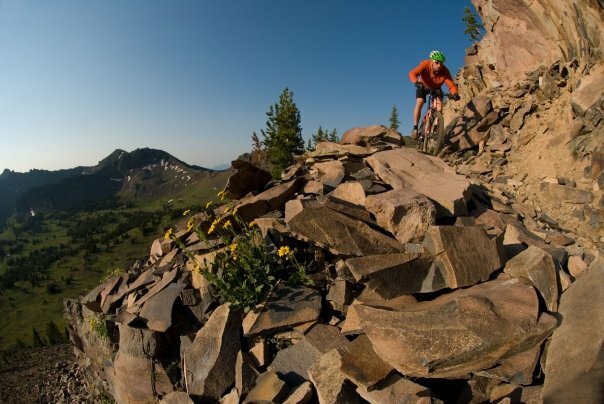 Maybe, just maybe, rock climbing can serve as the great physical connector between these two distinct sects of mountain biking. Your Turn: How do you go about becoming a well-balanced athlete? 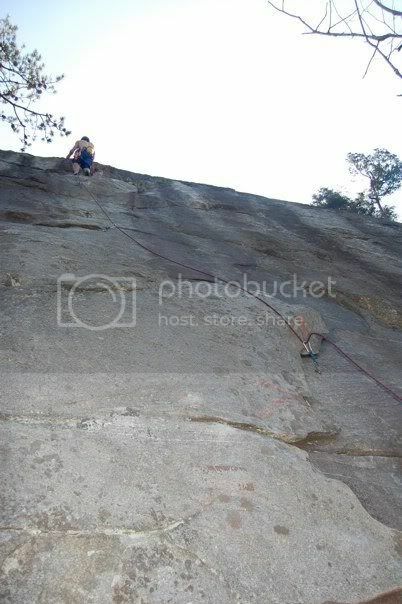 Climber: Greg (me). Photo: Sydnah Swails. Your decision to participate in other sports and exercises can either make or break your long-term performance as a mountain biker. I outlined the reasons behind this fact in my philosophy of cross training post. Rock climbing is one of the best sports that I have found to naturally complement my singletrack addiction. There are 3 reasons for this: It demands a different mindset, it works different muscle groups than cross country mountain biking does, and it works the same muscle groups as downhilling. The general mountain biking mindset is utilized in many other sports. The endurance mindset of mountain biking helps you to push yourself to the absolute edge of your body's aerobic and energy capacities, and then beyond that edge. The same endurance mindset is utilized in swimming, back country skiing, cross country skiing, strenuous hiking and backpacking, mountaineering, and any sort of running sport. The trail-tactics mindset of mountain biking allows you to read the trail at speed and make split-second decisions about how to handle your bike in order to overcome those obstacles. Sports such as downhill skiing, snowboarding, white water kayaking, trail running, mountain boarding, dirt biking and more require this same use of instantaneous terrain-reading and decision-making skills. Rock climbing, on the other hand, requires a uniquely different frame of mind to succeed. If you aren't an avid rock climber, a description of the mentality that a successful climber must possess may sound strange. In one sentence: Rock climbing is an even mix of yoga and weight lifting, with a healthy dash of summit fever borrowed from mountaineering. 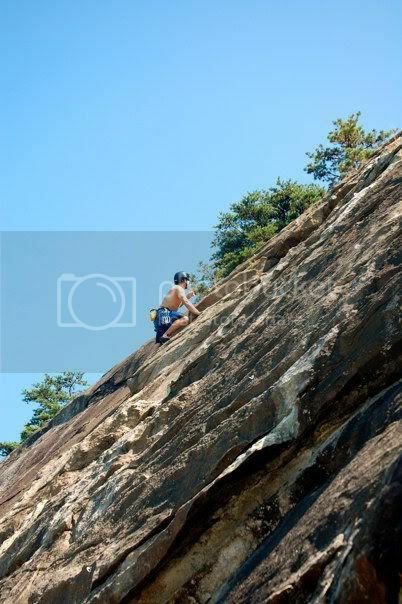 Climber: Andrew K. Photo: Syndah Swails. The relationship between mountaineering and rock climbing is very apparent due to the fact that the second naturally arose from the first. The most common characteristic that they share is the deep thirst to get to the top, which is what we're so concerned about as rock climbers. This thirst, referred to by some as "summit fever" in some contexts, is wholly unique to climbing disciplines. This does bleed over a little into mountain bike rides with a distinctive high point, but in general, the climbing-drive while mountain biking is fueled by the promised downhill adrenaline rush on the other side. In rock climbing, the simple sense of accomplishment stemming form overcoming such a daunting physical feat is the drive that motivates. The weightlifting mindset is also fairly obvious. Rock climbing requires intense, brief periods of hard effort, and the mental drive to push hard and fast instead of slower/more sustained and longer like on a mountain bike. The yoga mindset may not seem related at all to the sport of rock climbing from the view of an outsider, but any avid climber is aware of the similarities between the two sports. Yoga requires a very inward focus and an intense conscious awareness of the location and movement of all of one's body parts. Rock climbing requires the exact same precision and focus. The successful climber must know exactly where his hands and feet are going, exactly how to move his body to get them there, and basically must be constantly aware of his body position at all times. Mountain biking, on the other hand, relies much more heavily on practiced reactions and reflexes. When bombing downhill at 25+ miles per hour it is impossible to individually analyze every motion required to negotiate the barrage of roots and rocks. Rock climbing requires a much more deliberate and focused approach. The unique difference between the mountain biking and rock climbing mindsets is valuable because it allows you to take a break from mountain biking for a while and rejuvenate. Going hard after the same mountain bike goals day after day, week after week, 12 months a year can get old after a while. Mixing your athletics up is vital to keeping things (your life) fresh. 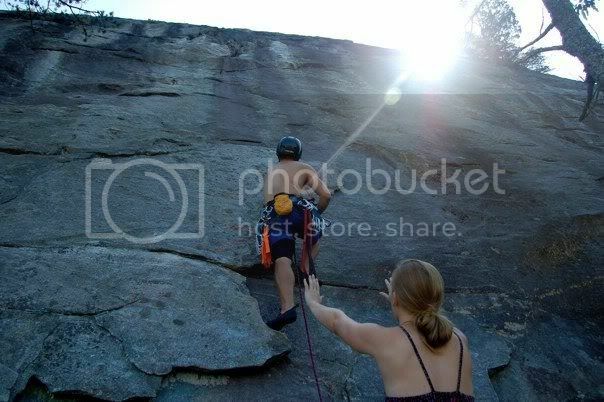 The inherent differences inherent in rock climbing allow it to refresh you mentally as well as physically. The next time you're starting to feel burnt out on your mountain bike, go try rock climbing instead! Your Turn: Are you a rock climber and a mountain biker? If so, do you agree with my assessment above? If you don't rock climb, what other sports do you participate in to "keep things fresh" so that you don't get too burnt out on the mountain bike? PS: Share this post on Facebook, Twitter, etc., get me a screenshot to prove it, and you'll get entered to win a free t-shirt. Click here for details! I don't know if ya'll thought I was kidding or what the deal is, but I'm seriously giving away tons of t-shirts absolutely free! Just to prove it, let me announce the winners for this week: A.J. H. and Andrew K. They both shared posts on Facebook, and are now getting free t-shirts! There were only 3 other people that shared a link and then let me know about it, and their efforts will roll over into this coming week's pool, so thanks guys. For everyone else, you need to get off the fence and enter! I've got dozens of t-shirts left, and they've all got to go! Obviously, the competition isn't very stiff, so get sharin' some Greg Rides Trails info, and win some free schwag! If you need more details on how this contest works, click here to read all about it. Again, congrats to A.J. and Andrew! Your turn: Still have questions about how the contest works? Drop a comment below and I'll try to straighten things out! The Long Branch Loop has to be one of the most beginner-friendly trails that I've ridden in the mountains of North Georgia. 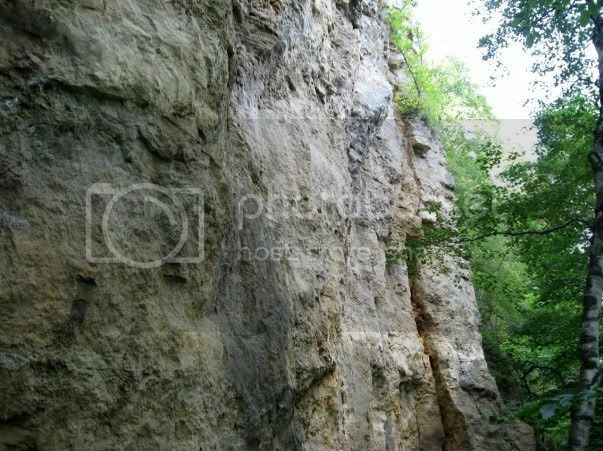 It is reasonably smooth along its whole length, and despite the fact that it does do a little climbing and descending, all of the climbs are moderate and the descents nontechnical. In addition, the trail is only two miles long, so it would be hard for a beginner to get in over their head. Despite the short length of this loop, there's always the possibility to do it again, or to combine it with the Green Mountain trail for a much longer and more challenging ride. Running between Long Branch and Green Mountain is a 0.7 mile long connector trail that climbs consistently all the way to the junction with Green Mountain. Ridden the other way, it's a screaming descent with a couple of sharp turns that can really surprise you if you're not keeping a sharp lookout! Bottom Line: This loop is an excellent accent to the Aska Trail System, and really allows it to cater to riders of all ability levels! If you're an advanced rider, it's easy to work this into a much larger ride. The National Geographic Trails Illustrated map #777 is awesome, and great for connecting Long Branch to other trails. Jim Parham's Off the Beaten Track contains the loop described above, and is an excellent, easy-to-use resource! 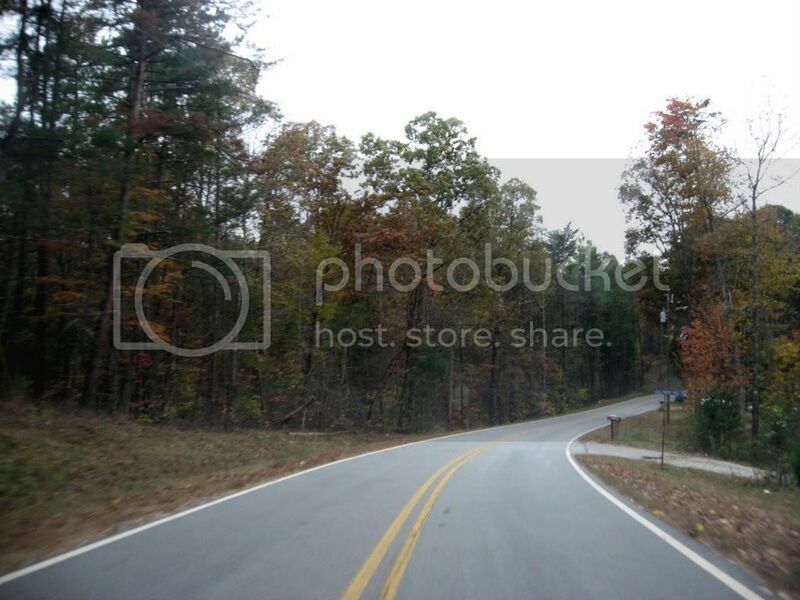 From GA 515 in Blue Ridge turn south onto Windy Ridge Road. Go 0.1 mile, turn left on East 1st Street, go 0.1 mile and turn right on Aska Road. 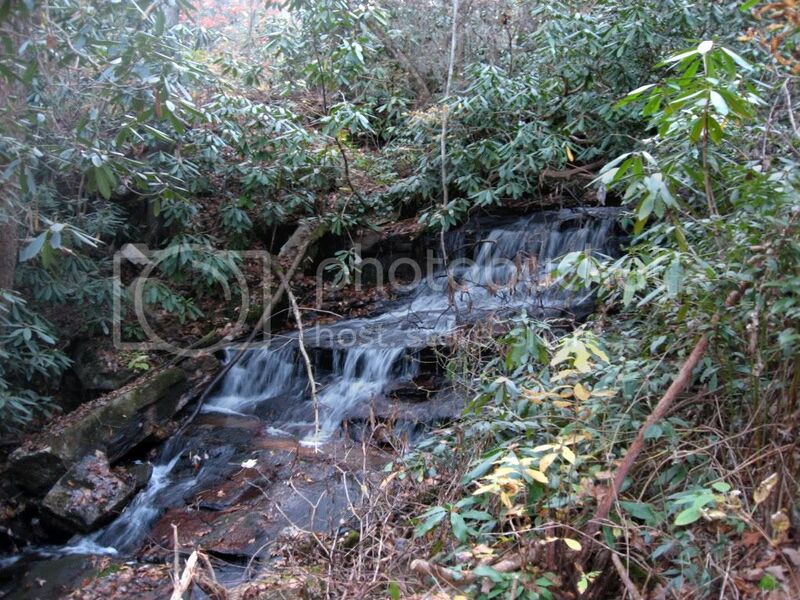 Continue another 5.9 miles and turn left onto Shady Falls Road. Go 0.2 miles to the Forest Service parking lot area on the left. Meet Big Todd. Todd isn't your ordinary guy. For starters, he's 6' 5". Secondly, like the rest of us on the Airborne Flight Crew, he is crazy about riding mountain bikes! Specifically, he is crazy about riding 29ers. Shortly after the announcement of the new Airborne brand, I believe that Todd's first question was: "Are you guys going to have a 29er?" Todd was originally selected as one of the 10 members of the Flight Crew, but he turned around and refused the spot. Yeah, that's a little crazy, right? Who turns down a free trip to the Sea Otter Classic in California and a free mountain bike? Well, between the time when he sent his application letter off to Airborne and he got his acceptance letter back, Todd was diagnosed with colon cancer. He was sadly forced to turn down the trip to California due to an ensuing course of chemo treatment. While the Flight Crew was out in California, we decided to make Todd an "honorary member of the Flight Crew," despite the fact that he couldn't join us. We wanted to do everything we could to encourage him in his fight against cancer. Fast forward 5 or 6 months, and after a long struggle Todd has beat cancer! This is no small feat, as colon cancer apparently only has a 40% survival rate. Todd had a better chance of dying than he did of living, but despite that fact he successfully made it through to the other side! Big Todd's personal 29er prototype. Non-stock decals and components. During the final stages of Todd's treatment, Jeremy Mudd, the awesome engineer in charge of product development for Airborne, was hard at work on the new bicycles soon to be gracing the Airborne line up. 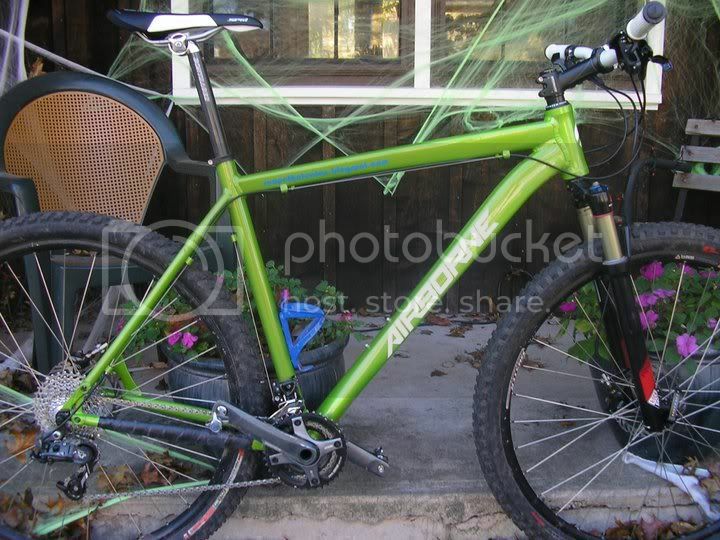 The first bike on the list was a hardtail 29er made in honor of Todd and his fight against cancer... and partially because of his begging/whining/pleading for an Airborne with big wheels. Oh, and it was probably also developed because 29ers are all the rage nowadays! Todd was truly the instigator behind this bike the whole time. It seemed like there wasn't a day that went by when he didn't ask Jeremy some sort of question about the progress of the 29er. 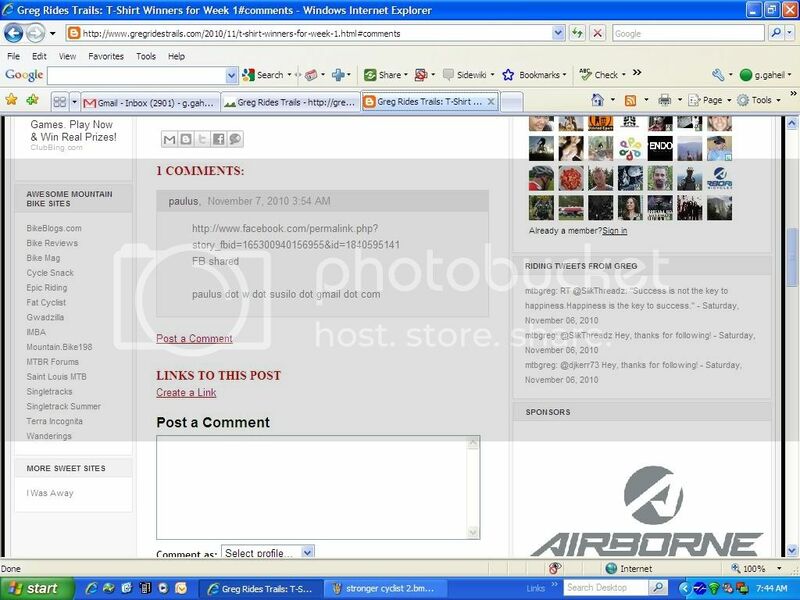 Well Todd, you have your Airborne 29er now! Of course, Todd is one of the lucky few to have one of the prototype frames. He has been out riding on it whenever he can get the chance, and in his own words: "I have to say, this is one of, if not the best, riding [aluminum] 29ers I've been on!" When this new 29er hits the internet for sale in early 2011, be sure to pick up one of these truly unique mountain bikes! PS If you want to read more about Todd's battle with cancer, check out the archives on his blog. 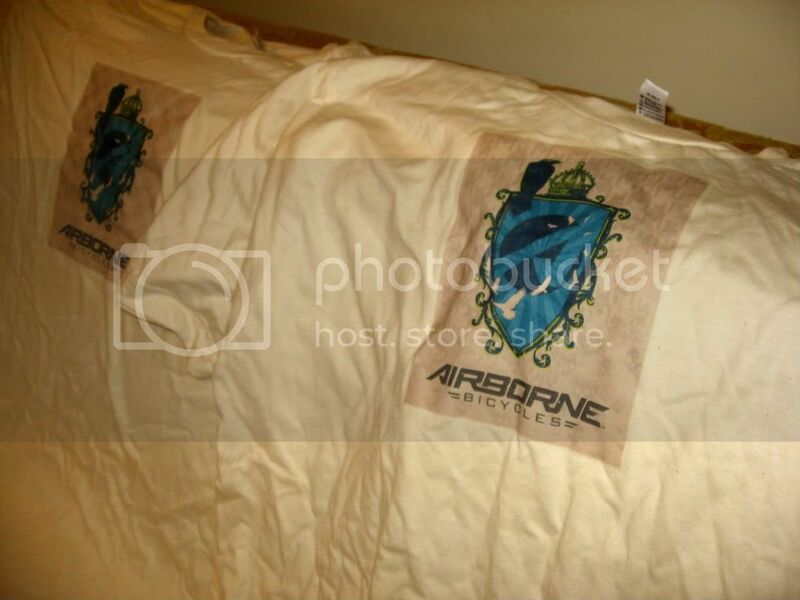 PSS If you want a free Airborne t-shirt, be sure to share this story about Todd and Airborne's 29er on your Facebook, Twitter, etc. Details here. 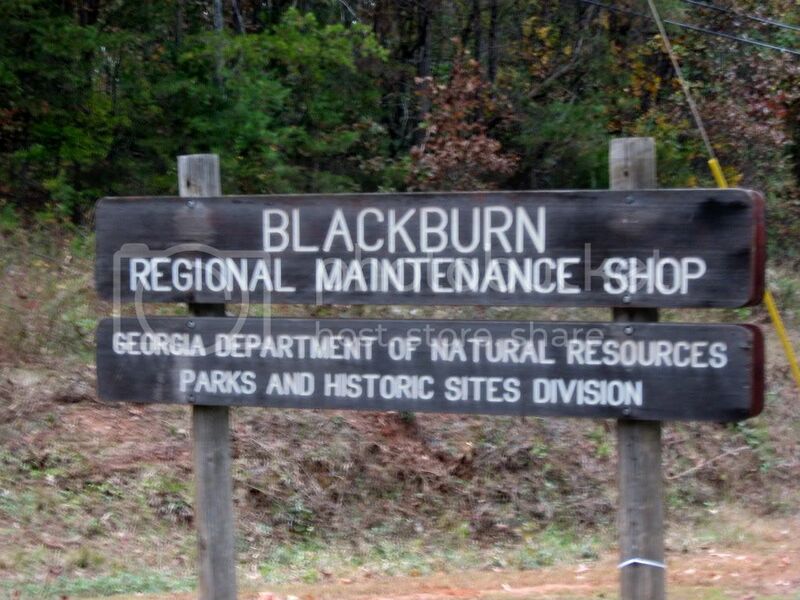 A local riding buddy of mine just alerted me to the fact that the abandoned state park behind Blackburn Elementary school just southwest of Dahlonega is potentially going to be reborn by the county parks department, and that mountain biking is one of the possible uses being considered for the 192 acre park. I've actually spent a little bit of time down there riding around on the abandoned roads, and have thought to myself: "man, these hills would be perfect for some mountain biking trails!" After I started discussing this with a few people yesterday, I found out that there are already some trails down there, albeit in sub-par condition. And, it doesn't sound like they are very extensive at all. If you want more information about the park and the direction it might be heading, check out this article from the local newspaper. What's exactly going to happen with this area still hasn't been decided. That's where we come in. Right now is the time for the public to comment on what they want to see happen and to do that, they've posted a public survey online for you to voice your opinion through. 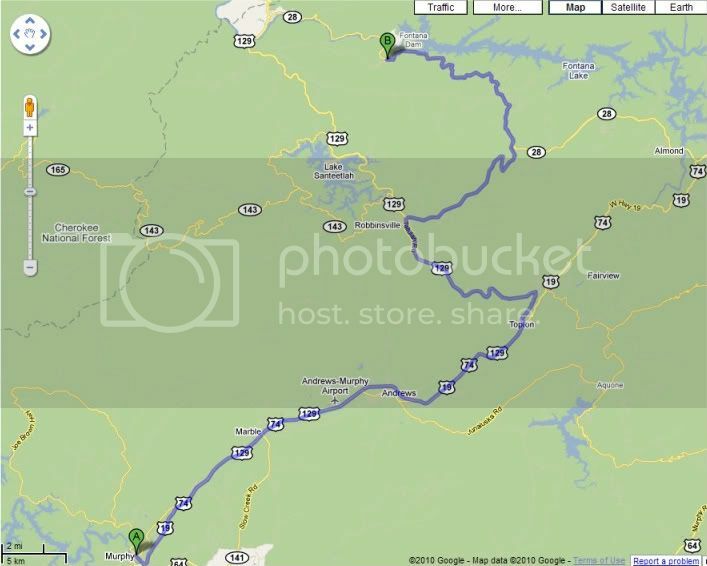 I know that some of the readers of Greg Rides Trails are local to the Dahlonega area, and that many of you reside in the greater North Georgia area within easy driving distance of where this park will be located. I exhort you all to participate in this survey, and stand up and be counted! Oftentimes, the general public does not realize the sheer size of the cycling community because we're generally content to just do our own thing and enjoy the peace and quiet of the woods. However, there is great potential here for new high-quality mountain biking opportunities in our region, and I suggest that we all take the very short amount of time required to simply fill out a survey and express our desire for such facilities! The forest on the left side of this road is one edge of the land in question. It's no secret that cycling, mountain biking included, brings serious tourism revenue to our local area. Georgia as a whole has embraced this reality especially when it comes to mountain biking, and it seems like new mountain biking trails are being added regularly all over the state. There's a reason the Georgia State Park system is so mountain biker friendly: mountain biking = $$. In order to establish itself as a true mountain biking destination, the Dahlonega area sorely needs some beginner-friendly mountain bike trails to round out our singletrack offering. While experienced riders such as myself and most of you that read this blog enjoy the challenge of the Bull Mountain trails, there's no place closer than Gainesville to take riders who are true beginners, or who are even early intermediate level. The climbs and technical challenge of the Bull / Jake mountain system are daunting for the uninitiated! 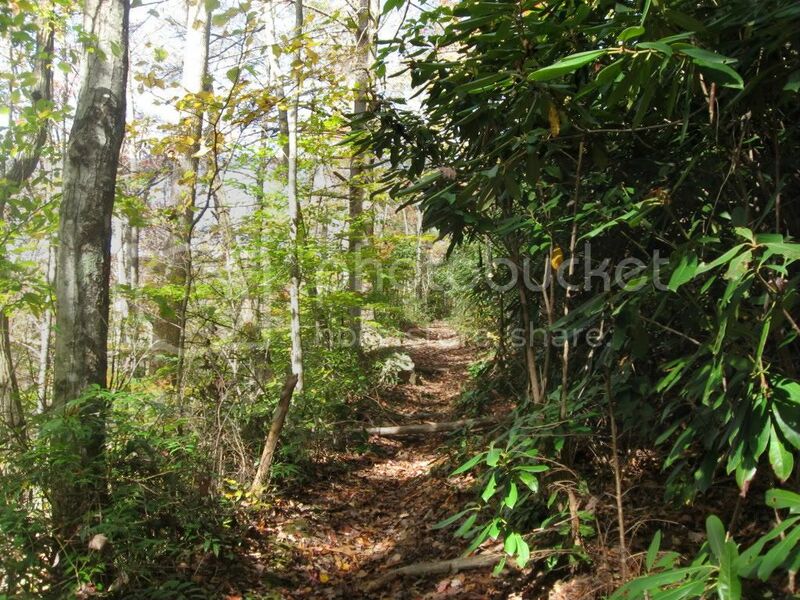 This potential trail system at Blackburn Park would be excellent for getting new people into the sport, and would also be an even more easily accessible option for current riders living in Dahlonega. In addition to offering beginner trails, this park could easily include intermediate and advanced trails in concentric loops like many of the popular trail systems here in the Southeast. If you can't tell, I'm excited about the possibilities! It is voting day, so why don't you vote for mountain bikes: click here to vote! 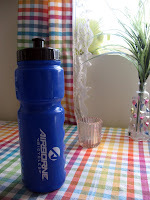 As you are probably aware if you're a regular reader, I'm a member of the Airborne Flight Crew, and as such I've been given free Airborne Zeppelin Elite and an Airborne Taka mountain bikes to test and review. In addition, I get to provide feedback directly to Airborne about their current products and the direction of their new products. And as a last little perk, they've hooked me up with a bunch of free schwag, including a ton of t-shirts and water bottles. I have been giving this schwag away to all of the people I ride with, my friends, and my family, and I've even given several away on this blog. It seems like I've given away 25-30 t-shirts, yet I still have a ton left! Here's the deal: I'm sick of that big box of brand new schwag lying around unused, So It's All Got to Go! That's where you come in. As a reader of Greg Rides Trails, I constantly strive to hook you up with the best information: reviews, how-tos, etc., AND free gear whenever I can! In short, I'm giving these shirts away 'till they're all gone! 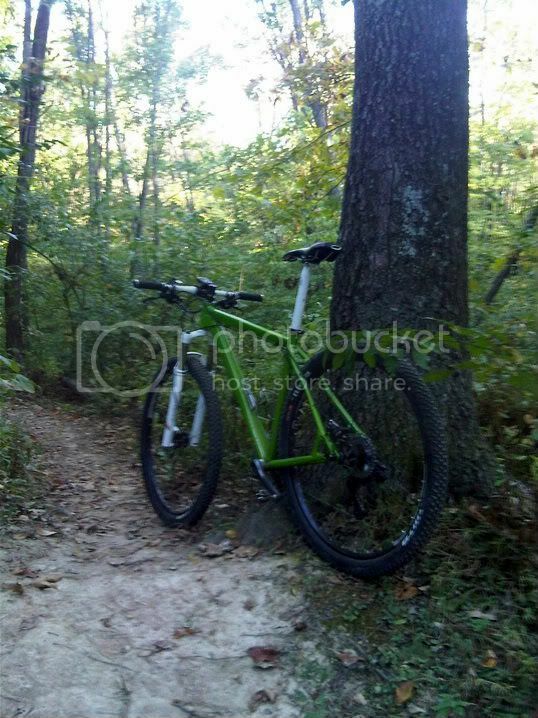 Share a link to a Greg Rides Trails article on Facebook, Twitter, your own blog, etc. You probably do this already, so this step should be easy! I will randomly select winners from the pile of evidence. I'll be giving away about 2-3 shirts per week... which means this contest has the potential to last a while! The more articles you share, the more chances you have to win. Every piece of evidence will stay in the pot until either it's chosen or the contest ends. Make sense? To get started, use the share buttons right below this post. 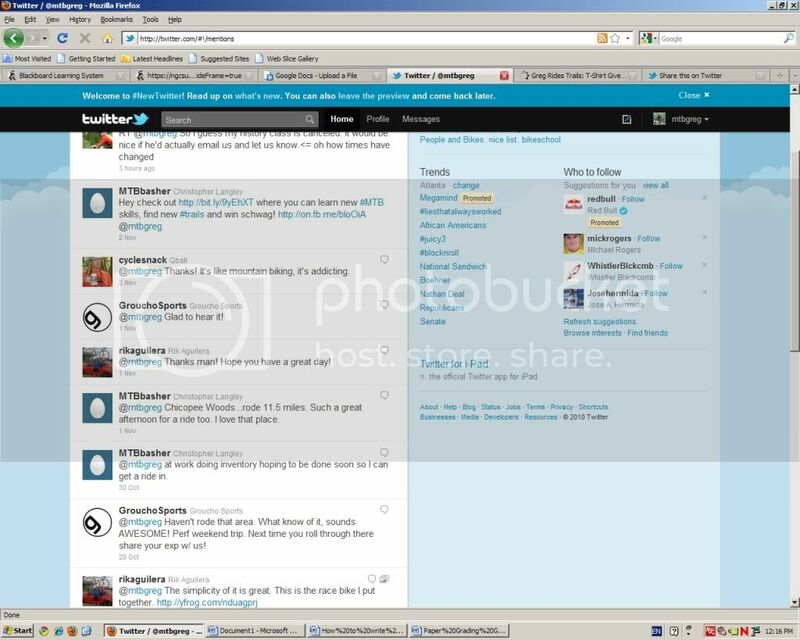 There are buttons for Facebook, Twitter, email, and Blogger. Send me the evidence, and I'll send you the schwag! Exit question: Does everyone know how to take a screenshot?